MEEKER COUNTY, MN – The man the Meeker County Sheriff’s Office had been searching for is now in custody, according to a press release issued this morning (Dec. 31). The Meeker County Sheriff’s Office received a tip at about 8 p.m. last night (Dec. 30) that Anthony Kalland was back at the CSAH 16 residence where the standoff took place Dec. 27. Shortly before 10 p.m., Kalland was taken into custody without further incident. Deputies searched the residence and found a loaded revolver, ammunition, and a small quantity of methamphetamine. Anyone with information on where Kalland has been over the past several days is urged to call the Meeker County Sheriff’s Office. The investigation regarding who helped Kalland evade law enforcement is ongoing. 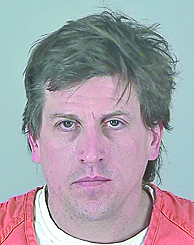 Kalland is being held in the Meeker County Jail pending his first court appearance. The Meeker County Sheriff’s Office received numerous tips during this investigation. Meeker County Sheriff Brian Cruze appreciates the public for their assistance in locating Kalland. The Meeker County Sheriff’s Office is searching for a man who allegedly brandished a revolver at a residence in Harvey Township Dec. 27. The sheriff’s office received a 911 call from a residence in the 58400 block of CSAH 16, in Harvey Township in reference to a domestic situation. The caller said a male, later identified as Anthony Steven Kalland, 38, of Brainerd, had brandished a revolver. The caller fled the residence and deputies responded. Deputies confirmed Kalland was at the residence and a perimeter was established. Kalland failed to respond to deputies on scene. The Kandiyohi County Sheriff’s Office tactical and negotiation teams were called in for assistance. Contact was made with Kalland, but he refused to communicate or comply throughout the afternoon. The standoff continued into the evening, and Kalland used the cover of darkness to sneak through an outer perimeter line and flee the scene. Deputies and Litchfield Police searched multiple locations that Kalland went to after leaving the CSAH 16 residence. A search warrant on the CSAH 16 residence was executed. A stolen vehicle, ammunition and drug paraphernalia was recovered, but the firearm was not located. Kalland is wanted on charges of domestic assault, felon in possession of a firearm and possession of a stolen vehicle. Kalland also has three outstanding felony warrants out of Crow Wing, Sherburne and Renville counties. Kalland is considered armed and potentially dangerous. Anyone with information on Kalland’s whereabouts is asked to call the Meeker County Sheriff’s Office at 320-693-5400. If anyone sees Kalland, they should immediately call 911. Do not approach him. A Wright County employee was found to have transferred private data to his home without authorization and in violation of county policy. Based upon the investigation conducted by the county, no evidence has been found that indicates there was any sale or distribution of the private data. The data was recovered and returned to the county by law enforcement. Since government agencies are held to a high standard for data protection, Wright County officials notified individuals because they felt citizens had a right to know this transpired – even though the data is back in the county’s possession. Employees are required to complete multiple trainings about protecting citizen data annually, and the county has several policies in place. This unfortunate decision by one individual to not follow policy has triggered this notification effort. While the policy investigation is complete, a criminal investigation related to this employee’s actions is ongoing. Toll free information line: 866-680-3212. Individuals who did not get a letter from the county did not have data accessed in this incident. The book tells a story of innocence, beauty, and loss through the eyes of children as they wander through nature. This is Haataja’s second children’s book. Her first, “Grandpa’s Farm,” is based on her son, Gil, who adores visiting his grandparents’ country property in rural Wolf Lake, near Park Rapids. Look for the full story in the Friday, Dec. 7 edition of the Enterprise Dispatch. DASSEL, COKATO, MN – Five students from Dassel-Cokato School District were recently interviewed by KRWC AM 1360, a radio station in Buffalo. The interviews will air the week of Dec. 10-14 at 6:50 a.m. and 4:25 p.m. SPONSORED POST — Two retiring physicians will be honored at Hutchinson Health at 5:30 p.m. Tuesday, Dec. 11. The public is welcome to join Hutchinson Health staff in the hospital foyer as the portraits of Dr. Jim Allen and Dr. Dean Nissen are added to Hutchinson Health’s gallery of celebrated physicians. Dr. Allen practiced at Hutchinson Health full time for 25 years before transitioning to a part-time position at the end of 2014. His recent work has been with patients in Urgent Care and the Travel Clinic. Dr. Nissen retired from full-time work June 1 after 33 years as a family practice physician at Hutchinson Health. Now, he occasionally sees patients in Urgent Care. SPONSORED POST — The public is welcome to attend a free presentation about the importance of colon cancer screening at 7 p.m. Thursday, Dec. 20 at Grace Lutheran Church, 430 5th Ave. SW in Hutchinson. The informational session will be led by Dr. Mark Stuckey, a physician from Hutchinson Health. Dr. Stuckey practices general family medical care, preventative medicine, endoscopic procedures, emergency medicine, and sports medicine. According to the Centers for Disease Control and Prevention (CDC), colorectal (colon) cancer is the third most common cancer in men and in women. Of cancers that affect both men and women, Of cancers that affect both men and women, it is the second-leading cause of cancer-related deaths in the United States.